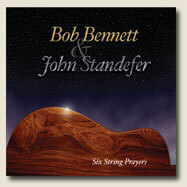 Renowned singer-songwriter Bob Bennett and award winning guitarist John Standefer have collaborated to bring you this wonderful mix of vocal and guitar music. Uncluttered from big studio over-production, the simplicity of two great musicians sharing their hearts through music shines through. Let this recording fill you with the warmth of the One who created us all. Life has its ups and downs. There are definitive moments and times of deep questioning. Wonderful times. Tragic times. And although the circumstances in our lives offer no partiality for people of faith, there is, nevertheless, a unique hope in the heart of every believer that allows us to react differently to these circumstances. The collection of songs found on this CD spans over continents and centuries of time. The various themes reveal just a glimpse of what faith is all about. You could say that these are musical sketches of the Christian life.